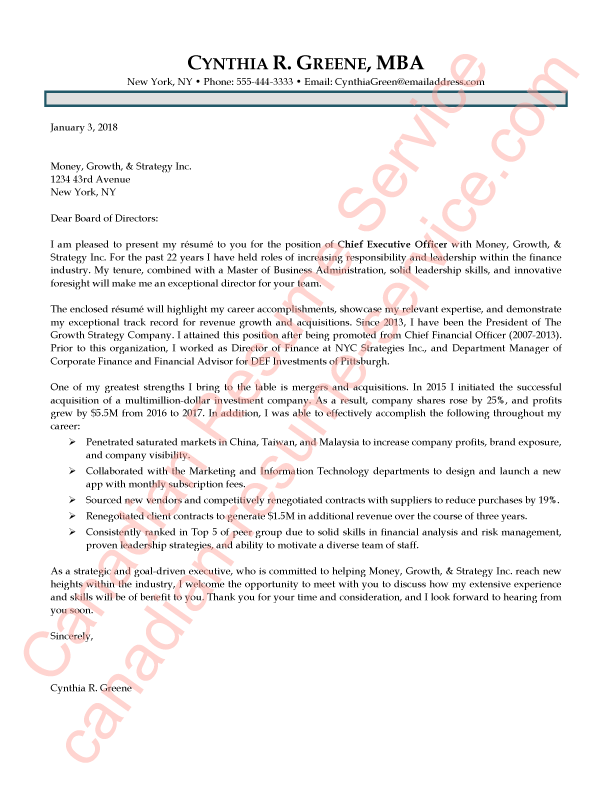 An Executive CEO and President cover letter sample for your review. This example cover letter was designed for an experienced Executive CEO and President to open doors to interviews she never thought possible. Scroll down to review the cover letter example. The job candidate is focused on continuing her senior executive leadership within the finance industry, and already has over 20 years of relevant expertise to boast about. She has a Master of Business Administration Degree (MBA), two Bachelor’s Degrees, and related courses and professional development to showcase. In addition, the client’s talents and skills are exceptional and would make her the perfect candidate for any executive-level position she applies for. There are many cover letter writing tips to consider if you are creating your own. The cover letter opens with the current date, address, and point of contact – standard points in any business letter. However, though this may seem standard and unnecessary to point out, many people forget this when crafting their cover letter. The introductory paragraph of the letter highlights her desired position right away, ensuring there is no question as to why she is writing the letter. After the formalities are out of the way, I wanted to bring her years of executive experience and stupendous educational credentials to the forefront. These are the qualifications a Board of Directors will be looking to check off their list first. In the next paragraph of the Executive CEO and President cover letter sample, I listed her top positions; thus demonstrating how her hands-on experience directly relates to the new position she is applying for. The executive recruiter or hiring manager can see how she would transition into the executive role easily and without issue. To set the client’s cover letter apart from the competition. Finally, we come to the concluding paragraph of the executive cover letter. It recaptures a few of the person’s skills, conveys her commitment to the company she is applying with and showcases her eagerness for a job interview. The greatest impact the culmination of these sections has is encouraging the reader to move on to the job applicant’s executive resume. After feeling the person’s passion and commitment, as well as reading about her excellent track record, who wouldn’t want to hire her?! Do you need help writing your cover letter to apply for the perfect executive position? You can review our executive level writing services, which include packages and individual services.